It’s not really fair. Buddha, above, has an advantage in the meditation game: he’s a statue. I’ve tried it. I’ve tried finding a still, small, quiet space in the world to sit still, quietly, and make myself small in the grand scheme of the world. I’ve tried praying, meditating, contemplating, but I have a great deal of difficulty. I can’t shut off me. If I were concrete, if I had been formed somewhere by an artisan or a concrete mold and there were no thoughts going on inside my head, I might be better at sitting still and finding a quiet place to think about life, about the things that really matter. Either way, Buddha always has the advantage. There are hundreds of Buddhas at Borobudur. It was hard to focus on just one, but this one, fully intact in his niche, seemed like he wanted some attention. Although, technically, Buddha didn’t seek attention, only enlightenment. Those of you who’ve been reading this blog for a while will recognize the difference between the lower stupas and the upper ones. The diamonds and the squares are indicative of how stable one’s enlightenment is. We hired a guide to take us up the Borobudur temple. He give us some interesting insights, along with some local folklore and some personal interpretations. The reason I titled this post “almost enlightened” is because of some information he shared when we got to the top of the temple. “The architect wanted to show how a person may be enlightened, but still not be entirely stable. The diamond shape can be tipped on its side, whereas the square is stable. Nothing can move it on its side, nothing can upend it,” was his reply. Because we are still human, even though we may achieve enlightenment, we may still be upended, knocked over. I think there’s a good lesson in that. Photo Friday’s challenge this week was “Spot“. When I was in Oregon last week I spotted this woman on the beach far below the viewpoint that Oregon nicely provides to travelers. 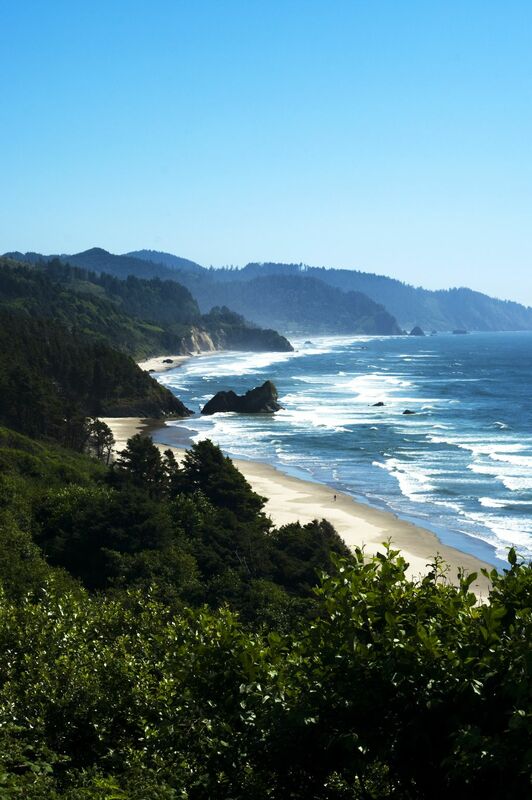 This beach is situated between Cannon Beach and Arcadia Beach. Both are beautiful beaches and in order to get to the area that you see above you have to walk from either of those two beaches. There is no direct route to this beach. It looks like the perfect place to take a walk, doesn’t it?